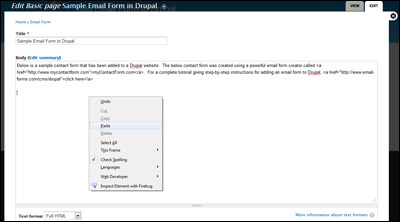 The intent of this article is to provide step-by-step instructions for adding a contact form to your Drupal web site. An example form created using a Drupal web site can be seen here. Before opening up your Drupal site, it is important to first design your contact form and generated its HTML code. The best way to do this is using a free email form service such as myContactForm.com. We've written a complete myContactForm.com tutorial here. a. Go to your Drupal web site and login to the administration panel. a. You can add your email form to either an existing content page on your site or you can create a new content page for the email form. 1. Navigate to the page that you would like to edit and add the email form to. b. In the new window that opens which allows you to add/edit the content of your page, scroll down to the selection box that says Text Format and select Full HTML. c. Paste the form HTML into the Body box (CTRL+V or Right Click and Select Paste). If you do not have your form code created and copied, please read this tutorial to learn how to do so. 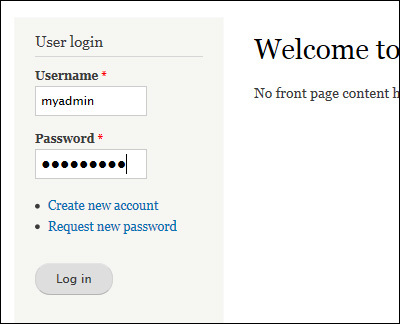 A sample form created using a Drupal web site can be seen here.